This section connects the Bronco Trailhead to the Bartlett dam road. 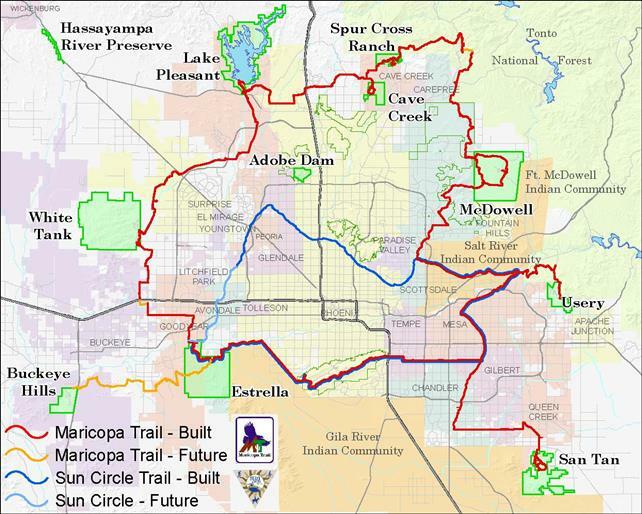 As of the writing of this description this segment of the Maricopa trail is about 95% complete. It was listed as opening in December 2017. This hike can easily be done as shuttle or an out and back. For the shuttle drop one car off at the Bronco trail head and another by the ranger station off of Bartlett dam road. Without having an information on this trail or where it ended up at, I decided to start at the Bronco trail head. Now that I know where it goes, I would start at the Bartlett dam road. The trail starts by crossing the road across FR24 to go the right and turn left at a Tonto native American culture sign. Follow the road up to the powerlines. At the power line you should see a Maricopa Trail sign to your right (south). The trail follows an old road that that's been freshly re-cut. The trail crosses a couple of washes and the Sycamore canyon. You have views of the Seven Springs road. At one point you are looking down at the Camp Creek residence area. There is a locked gate at this point. I hope it's replaced with a hiker friendly gate. I was able to get around the gate without much effort. Soon after the Camp Creek residence area you will start to climb up to and go past the power lines. At this point your on freshly cut trail. The trail was so fresh there was still tire marks from mini-dozer still on the ground. The trail is very well defined. I had 0 issues following the trail. You go up on the right side of a canyon with views of drainage. This is when the trail gets interesting views. You'll keep on climbing and cross the drainage once before hitting a saddle (high spot of 4,200 feet). At the saddle you'll have views of Cave creek, McDowells, Superstions and Four Peaks. Now you'll start dropping down fast while being able to see the trail far into the distance. You'll cross FR1058 and then one or two washes before heading up on a ridgeline. The ridgeline takes you to the confluence of the Blue wash and the Camp creek. If there's a spot where you might get off-trail if might be here. You go across about 150 feet of wash. As long as you go in a straight line, you'll be fine. The trail climbs out of the wash by a fence line. You climb out until you hit the power lines. The trail follows the power lines to the Bartlett dam road. This a fun hike exploring a part of Tonto forest that's not too far from town. There's remote feeling on sections of this trail, while others feel like you’re in town. Going from Bartlett Dam road to the Bronco trail has more elevation gain and it's more concentrated in one spot. Take the 101 to the Pima Road Exit and head north on Pima Road. At 11.8 miles you intersect Cave Creek Road. Turn right. At approximately 4 miles you will come to the Bartlett Lake turnoff. Stay to the left at the turnoff to Bartlett Dam Road. Continue 7.6 miles to the large trailhead on the west side of the road. Cave Creek Road turns into FR 24. The pavement ends 4.5 miles past the Bartlett Dam Road turnoff. The dirt road is passable in a car.